France has been leading on climate and renewable energy goals lately, and now it’s filling in some of the details to get there. The parliament passed legislation that requires either solar or green roofs on all new commercial buildings. Unfortunately, the bill got diluted at the last minute – requiring rooftops to be only partially covered. While solar systems produce electricity, green roofs increase a buildings’ energy efficiency along with other benefits. 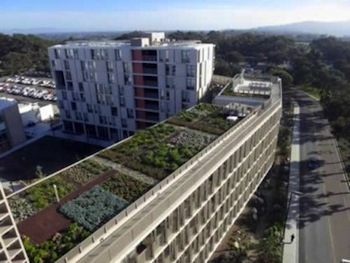 One of those is that green roofs reduce the urban heat island effect around buildings. The air around green roofs can be 62 degrees F cooler – just slightly behind street trees, says Chris Brunner, co-founder of New York Green Roofs. They reduce the amount of energy needed to heat a building in winter and cool it in summer. Toronto has been requiring green roofs on industrial and residential buildings since 2009. Besides implementing a carbon tax and establishing strong targets for emission cuts and renewable energy, France banned fracking. 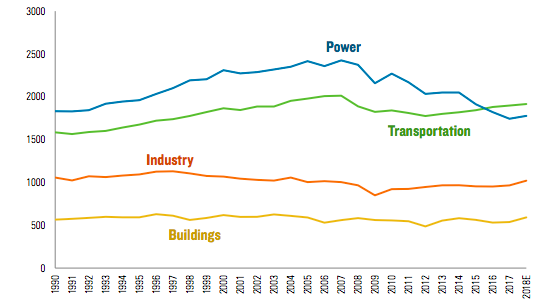 There’s another way to mitigate the heat island effect – widespread use of electric vehicles (EVs). How? Because EVs emit much less heat than conventional ones, greatly reducing the heat island effect and therefore the need for air conditioning during summer months. In Beijing, China, for example, EVs emit 19.8% of conventional vehicles, lowering heat island intensity by about 0.94°C, and air conditioner use by 14.44 million kilowatt-hours – reducing daily carbon emissions by 10,686 tons, according to research published in Nature. In fact, the heat released by vehicles and air conditioners are major sources of the heat island effect, they say. Read our article, White Roofs Win As ‘Coolest’ Roof.